This includes de-stashing fabrics I know I will never use and letting go of the idea that everything I do needs to be perfect. I am not perfect, and my quilts will not be, either. I went through my stash and was honest with myself about whether or not I would ever use a fabric or not. Some fabrics are not quilt shop quality, and they were easy to let go. Some fabrics were gifted to me and have languished in my stash for years. Some fabrics were used on a particular project and are not likely for me to ever use again. Other fabrics were harder to let go, and I probably kept a handful that I might de-stash in another few years. 🙂 But overall, it was a great process for me. And holy moly, did I have a lot of blue fabric that I was ready to let go. I posted a big messy pile on my Instagram feed yesterday wondering what I should do with the fabric, and I immediately got some great advice from Esther @ipatchandquilt: she recently went through a de-stash process and then gave her fabric to a friend looking to get started sewing. That was just the spark I needed. I reached out to a friend who has said she is interested in learning to sew / quilt, and it turns out she has been going to her church and helping to make quilts for children. I am very excited to be donating these fabric to her as a stash starter kit, and I hope some of the fabrics find their way into her generously made and donated creations. I also heard from Cheryl @Meadow Mist Designs about a fabric de-stash and swap that her modern quilt guild hosts twice a year – what a great idea! So, keep in mind that your de-stashed fabrics might just be what someone else is needing! Do you have any other great de-stashing tips or recommendations for organizations that accept fabric donations? Linking up with Tips and Tutorials Tuesdays (button on the right). There are always IG destashes to make a bit of money back! People are always looking for older lines (especially by the hot designer of the week) and lots of people like collecting scraps too. What a terrific gift to give someone just starting out! That is such a generous gift to someone who is just starting out or is just trying to establish a stash! I know that I’ve been at this for a few years now and my stash,despite a hefty investment, is still woefully lacking. I am sure that stack got her quite some ways towards having a good start. Those are great ideas Yvonne. I am sometimes stumped on how disperse destashed fabric, but hit on the right circumstances twice this last year. Not to long ago a friend mentioned that there were no fabric shops where she lived. I had some fabrics that were right up her alley, so sent her a surprise box. Another time, I went on The Quilting Board website and searched for Quilts for Kids. I found a quilter there who makes dozens of QFK quilts each year, as well as pillow cases for battered women’s shelters. I sent her a private message to ask if she would like a big box of fabric. She was very thrilled to receive them. Went I went through my quilting fabrics I put a bunch I knew weren’t likely to sell in a bag and then donated them to Art Street–a local studio open to the everyone for free. It’s in the same building as Healthcare for the Homeless, so it is mostly targeted at those people. My mom works there as an art therapist (I think it is almost entirely staffed by counselors and art therapists) and they have closed group sessions throughout the week too. The art that is made by the homeless people is kept in a safe area and then they have a gallery show/sale a few times a year and they are able to make some pocket money. The place is amazing in that is has pretty much every type of art medium you can imagine. Anyway, you can also look for places in the community that would accept crafting materials. Ahhh… the de-stash. Isn’t it amazing how many fabrics are living in our stashes that don’t have a purpose anymore? I keep a Rubbermaid tote in my studio and when I come across a fabric or a book or anything sew-y that I’m just not that into, I toss it in the tote. Eventually, the tote fills up and I offer the contents to the members of my Bee or my guild. This is a similar method to what I use for thinning out overstuffed clothes closets. If I didn’t need to take it out of the bag/tote in the time it took to fill it (usually months), then I really didn’t need it anyway! May you love your stash and stash only what you love, so you’ll use it. Our guild does a once a year destash (we call is “restash” since many of us actually bring home as much as we brought in) and it is always hugely popular. The left overs are donated to a local charity that gives craft supplies to teachers. Destashing is always so hard but I have three bags… one with small scraps, one with large scraps and another that I started which is getting rid of all that I know I will never use. Others are ones I am ok gifting and for swaps or people getting started… I was just gifted 6 bags plus some boxes full of fabric – so it will feel good to get rid of so much ‘weight’! haha. 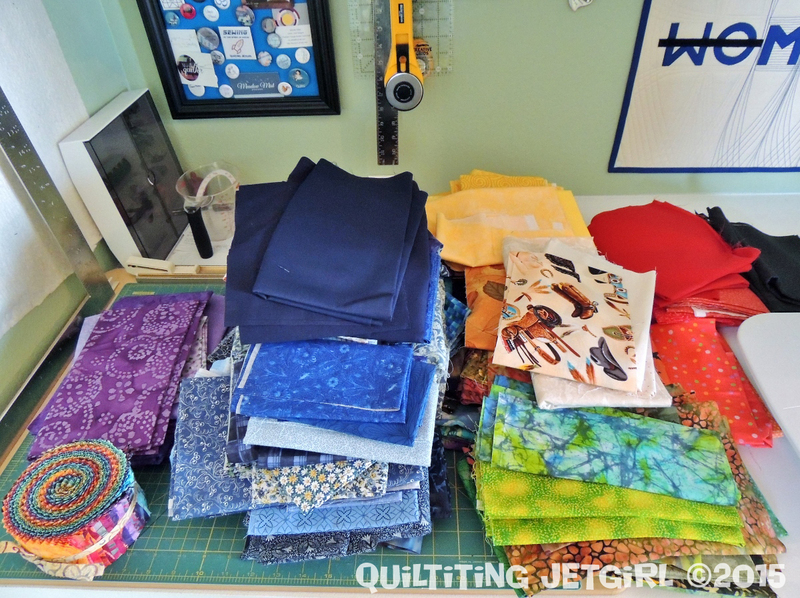 You have lots of lovelies that are going to be turned into some amazing quilts! That’s exciting! I would feel happy, too! Even though my stash is small, I need to do this. There are definitely some fabrics in there I’ll never use. What a great idea to give to a new quilter! Just before I started blogging I gave away about a third of my stash, and I haven’t missed it. I like to give some to my nieces or friends and have donated some to goodwill. I have also just made super simple quilts to just use it up and then donate. I love stash busting quilts. I really need to do this, but keep delaying. What a great idea to donate it to someone starting out new! No tips, but your post is a good boost for me to finally do the same. The fabrics I was buying when I first started sewing are very different from what I’m using now, and I also got a whole bunch of fabric from someone early on, most of which I really quite dislike. agh its on my to do list but I haven’t the heart at the moment, getting through deadlines and need to pet some of my faves for therapy this week! That is a wonderful idea on what to do with your destash, you know that the fabric is going to be made into a wonderful gift for someone in need. You did incredibly well destashing that much! And what a perfect place for it to go. I’m trying to get rid of some of mine to be more organised at the moment and I’m finding it really difficult to let much go. I keep looking at bits (even tiny bits, my scraps are as bad as my bigger pieces!) and thinking, yes, but I might use that! So far I have 3 bags to go, but then Theo sent me off to a pet shop for him today, his preying mantis is in urgent need of fruit flies, and unfortunately the only pet shop that sells the flies happens to be very near to 3 lovely charity shops and I came back with 4 huge (lovely!) wool blankets and 3 large remnants of fabric – probably a greater volume than the 3 bags to go! I’m a lost cause! I donate to my local no-kill animal shelter, the SPCA in Briarcliff. Also old towels, bed sheets, etc. P.S. It is wonderful when I volunteer at the shelter to see the de-stash fabric being used to provide comfort to the dogs and cats. That’s a great way to destash, Yvonne! I think it’s wonderful to bless someone with your extras. I believe that when you bless others, it comes back to you. I believe that when you have a need (whether quilting related or not), someone else will step up and help fulfill your need, too. It might not be what you wanted yet it may be exactly what you need.